Many forms of energy production produce pollution that affects the environment. For this reason there is a search for practical means of producing sustainable energy that does not produce pollution, or use up world resources. Some weather related forms of energy include solar power, wind power, hydroelectric power and wave power. There is still much discussion about how useful these forms of energy are. It is worth researching the different points of view on this topic. 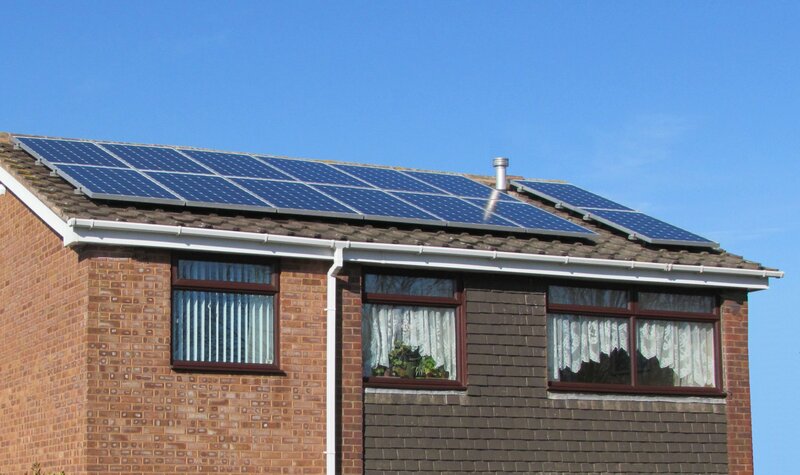 In the UK solar panels are increasingly being installed on roofs.The house on the right has 14 photovoltaic panels on the roof. These panels and their related systems turn the energy from the sun into electricity. Although the UK is at quite a high latitude, and so does not get as much sunlight as places nearer the equator, some people think that it is worth using this method of generating electricity. If more electricity is produced this way, then less pollution is produced by Power stations. This roof was very suitable for solar panels. It is south facing and so faces the sun for most of the daylight hours. It does not have anything close by to cast a shadow on the panels. This means that they will work efficiently. 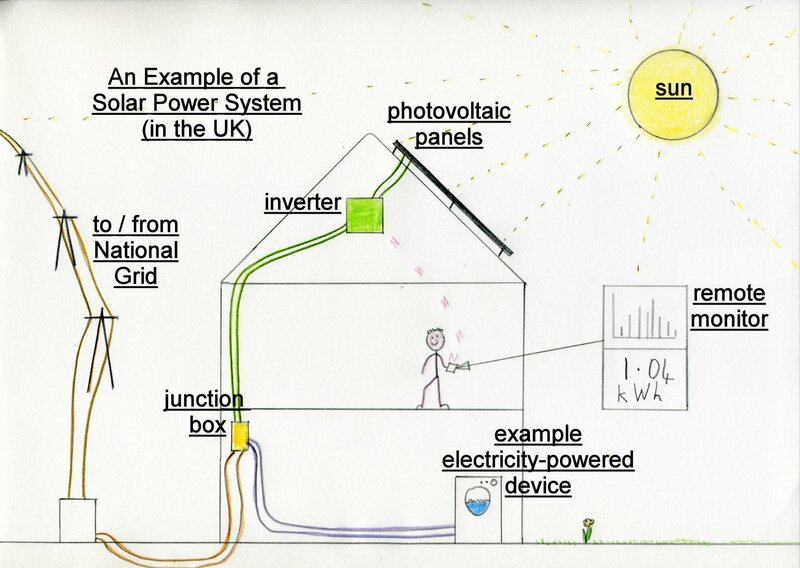 If you are able to produce your own electricity using solar panels you will be able to sell your electricity. A generation meter, like the one on the right, records how much energy you put into the system. If you can use the electricity you produce you will get that electricity free. You need to know how much electricity you are producing. Is it enough to power a washer, the dishwasher etc.? A special meter is installed to show how much electricity has been generated. Some systems have a bluetooth device which shows how much energy is being produced. This is measured in KWh, kilowatt hours. This is updated as the sun goes behind clouds and is higher or lower in the sky. The output of the solar panels can also be affected by shadows being cast from nearby buildings or trees. Some remote weather stations can monitor solar radiation. 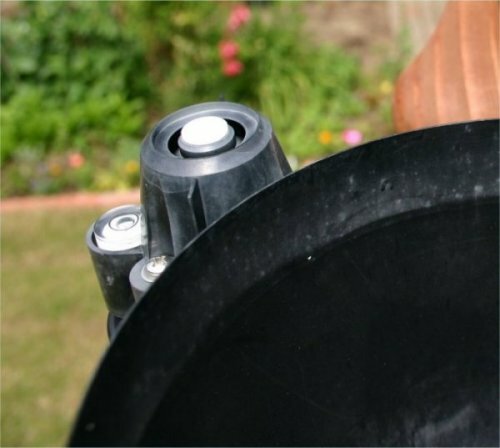 Click here to see a solar radiation sensor. These are some points to consider. If you do some more research you may find other things to think about before you decide if you agree with using this renewable energy source. Is the location sunny enough? 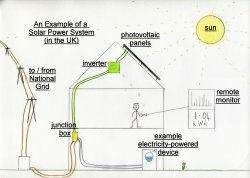 What resources are used in producing the solar panels and the bits to make them work? The power of the wind has been harvested for a long time. One of the most effective ways was in the form of a windmill. Large sails would catch the wind and turn round. This movement would then be harnessed to do a variety of jobs. 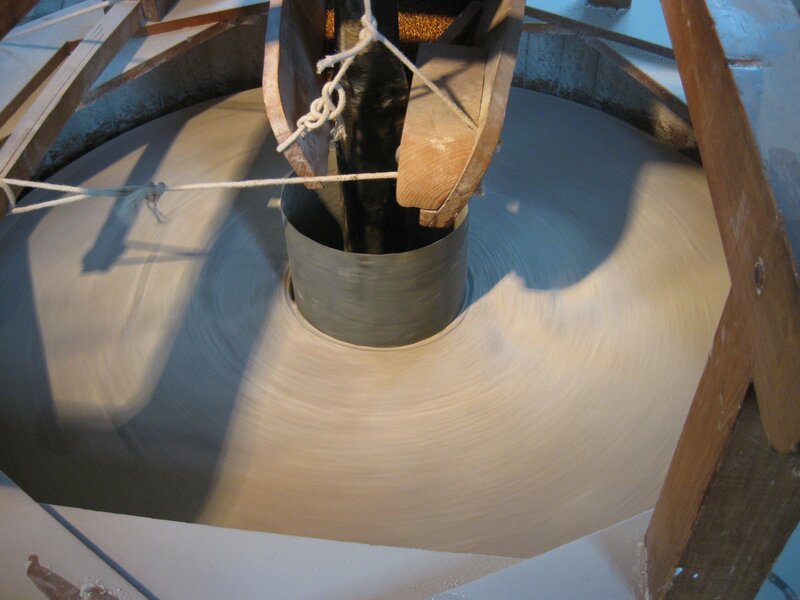 These included turning milling stones to grind grain or working pumps to move water. The windmills were built in places where there was plenty of wind. 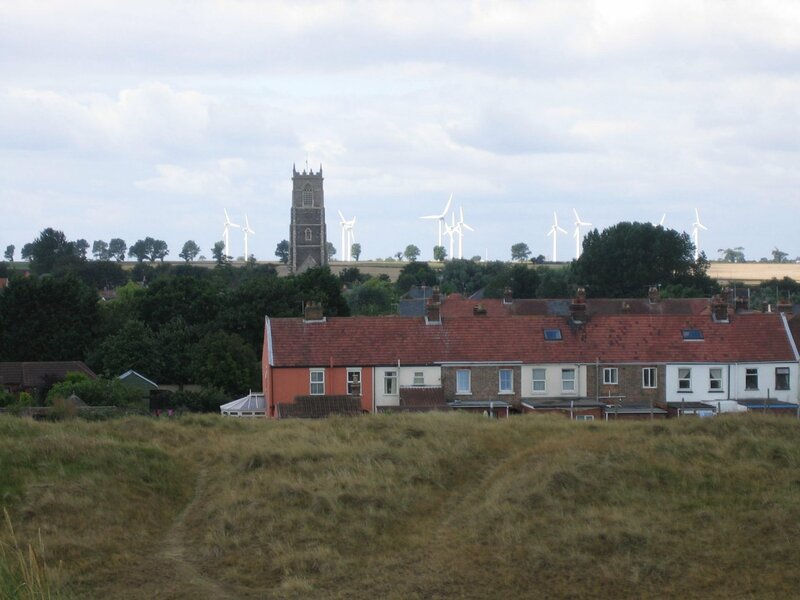 The windmill on the right is by the coast. You can see the reeds bending in the strong wind. 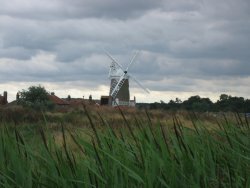 When you look close-up at the windmill you can see that the sails show that it is no longer in use as a windmill. 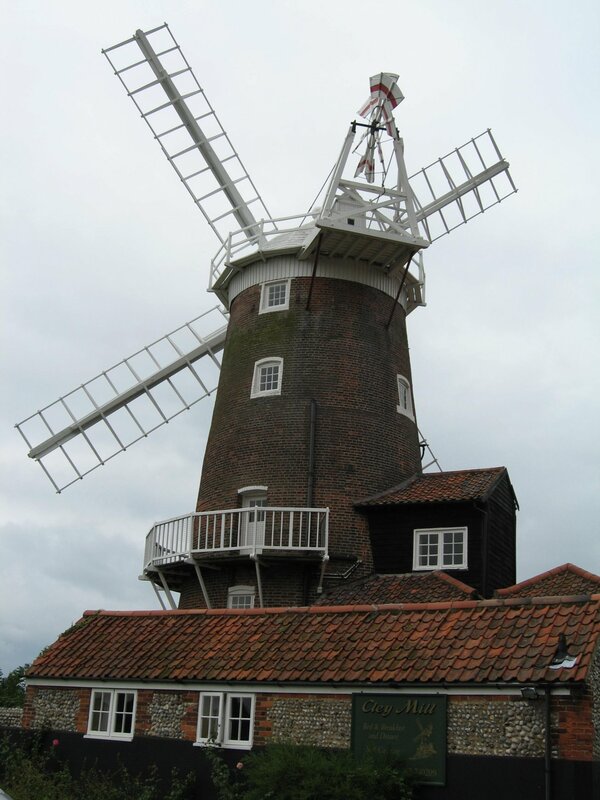 In Nottingham there is a windmill called Greens Windmill that still works. It is placed at the top of a hill so that it gets a lot of wind. The sails can be adjusted so that when it is very windy it does not blow away! If you look closely at the video clip you will see that two of the sails are folded back as it is very windy. You can look round it and see the mill stones turning. Modern windmills are used to produce electricity. They have large turbines which are driven by huge sails. These need to be placed where it is windy too. This is often near the coast, at sea or on high hills. Sadly these locations are often very beautiful ones too. To see a different view of the 'Wind Farm' on the right click here. How do you think these villagers feel about them? 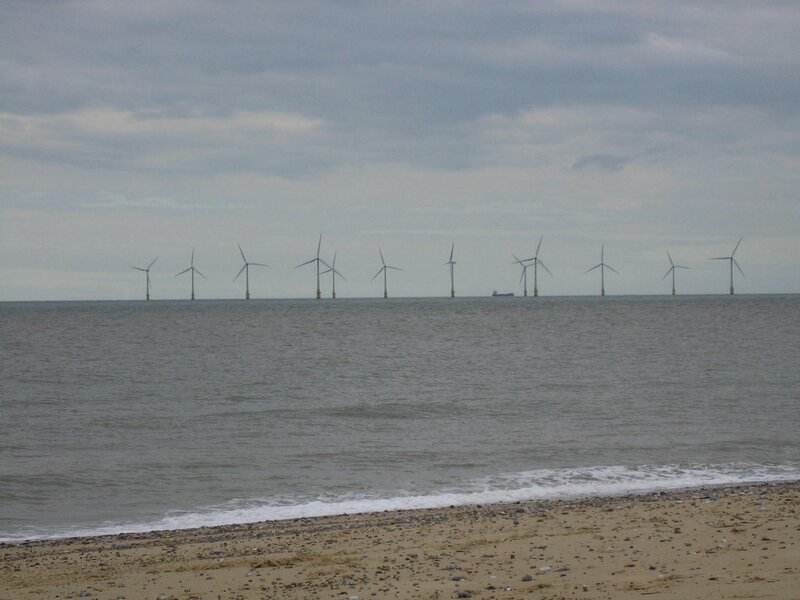 When the wind turbines are located at sea they still need to be in carefully selected locations. Vessels at sea will need to navigate round them. They also might not be appreciated by some holidaymakers at the seaside. 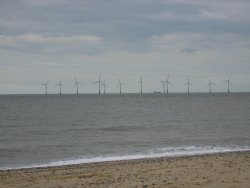 It is quite expensive and difficult to repair the turbines when they are out at sea. 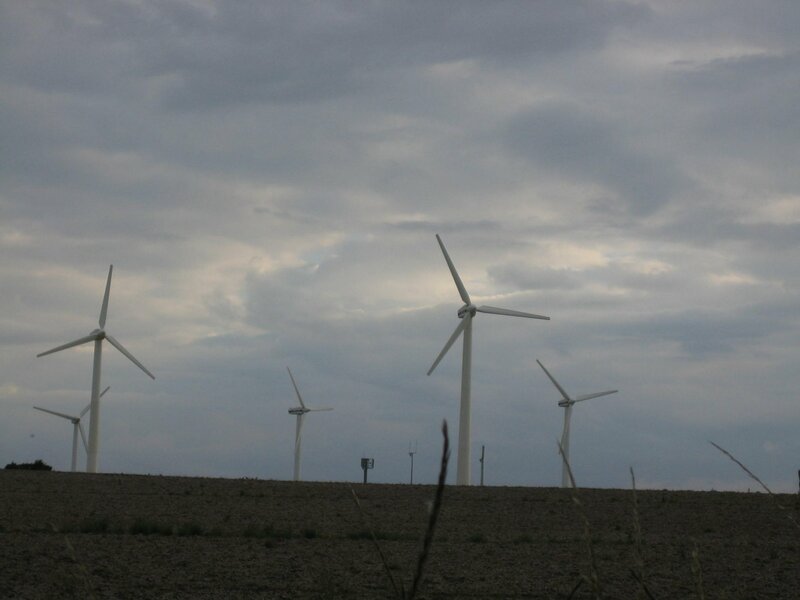 How much will it cost to build and maintain the turbines? 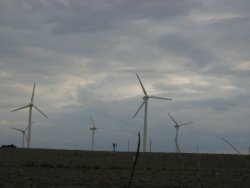 How much energy will the turbines produce? What impact on the environment will any development have? Water can be used to turn turbines to produce electricity. For there to be enough power in the water it usually has to be falling from a great height or flowing fast. Often water is dammed creating a reservoir. the water is then released in a controlled way and used to produce power before it flows on its way. 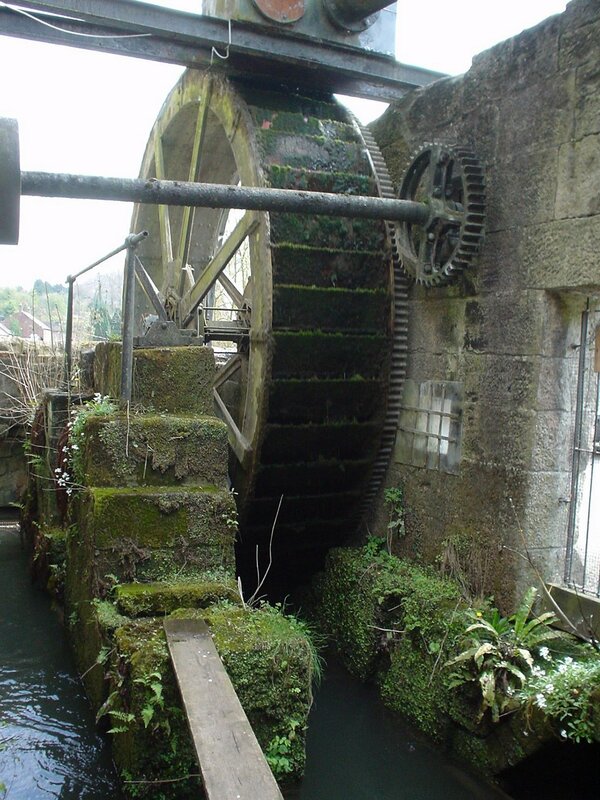 For hundreds of years water was used to turn wheels and the power used to work machines. Water wheels, like the one on the right, were often used to grind materials. 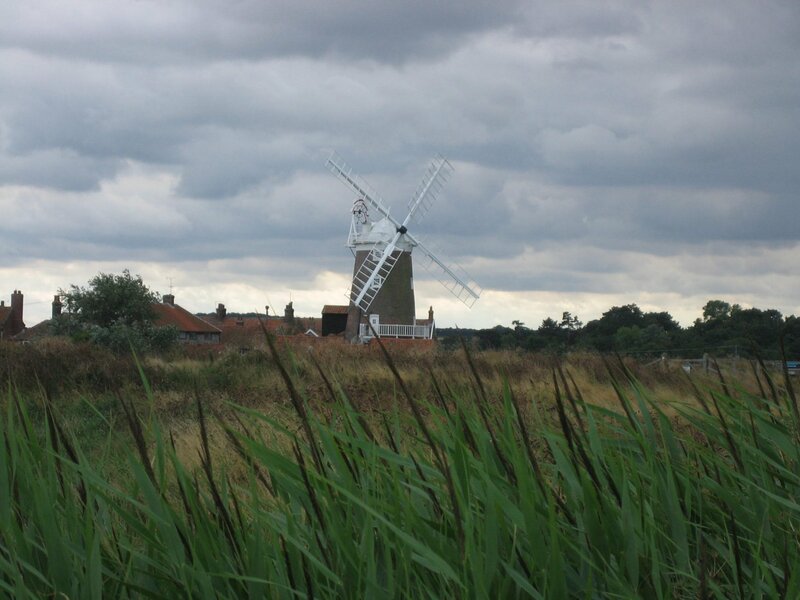 Some, like windmills, were sued to grind grain. This one on the right still has water flowing past it. The water to power old water wheels was often channeled into special pools or streams so that it could be controlled. This still happens when new water powered electricity stations are produced. Often a dam is built so that a reservoir of water can be created. This can be used when required. Some Hydropower Stations pump water up to a high reservoir when power is not being used, then let if flow back down when power is suddenly needed. This is a way of producing electricity very quickly. 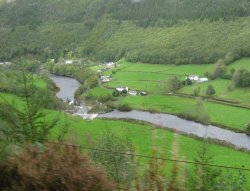 This photograph of Rheidol Hydro was taken from the train that runs along the valley. Water flowing in the River Rheidol can be used three times to produce electricity. 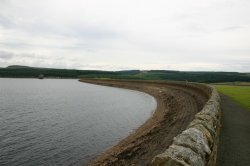 This is Kielder Water. 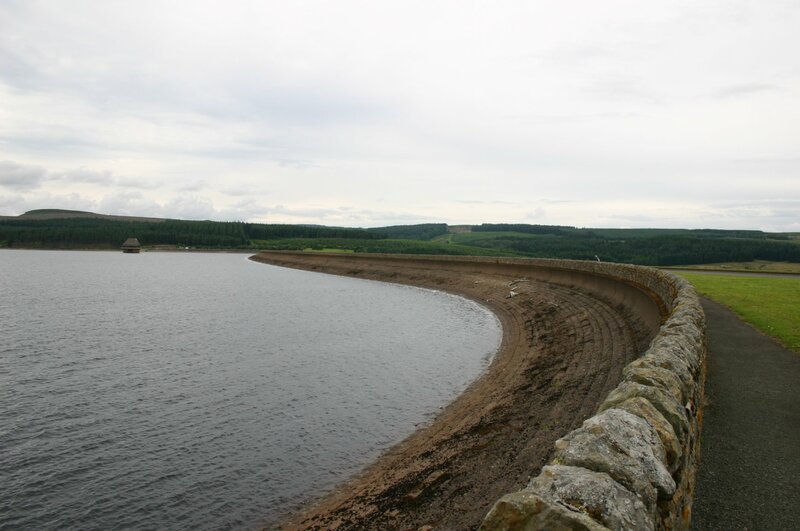 It is a reservoir which was built to supply water to the North East of England. As an added benefit it is used to produce electricity as the water is released. The reservoir is the largest man-made lake in Northern Europe. Imagine the area it covers. What was there before? Does the construction of the facilities destroy any of the natural environment? Will there need to be any change to the transport system (new roads etc.)? Is the location and the weather there suitable to this means of producing electricity? Linked to the weather topic is climate. Weather studies are concerned with short term recording of data and events. Climate is different because it is a description of the typical weather in a specific area over a thirty year period of time. There is a lot of discussion about our changing climate. Some would go so far as to say that there is no long term climate change. Others are very worried that our climate is changing for the worse. It does seem that many people have seen a change in the climate in their lifetimes. They say that winters are not as cold, there is not as much snow and that they remember much more rain. Some scientists point out that there have been many big changes in the weather, and that it goes round in cycles. This is a discussion that will go on for a while, and people need to continue to collect and analyse data. There have been many examples of extreme weather in the last decade. You may remember some recent very hot, dry summers. There are children in the UK who have hardly seen any deep long lasting snow. In other parts of the world people have witnessed serious extreme weather events. These include bush in Australia and forest fires in the USA caused by drought and high winds. By collecting your own data you will be able to understand the data that others have collected. You can get to know the units of measurement and the many terms that are used in discussions about climate and weather. Find out if you think renewable energy produced from wind, sun, waves or water is right for your area. 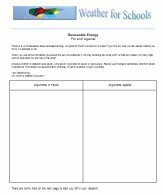 Use this worksheet to help present your findings. If you need more help look at the hints document.